Benjamin Smith was born in Beeston on 11th March 1897, and baptised in the same year on the 2nd May. He was the youngest of two sons of John Albert and Rose Annie Smith of "Fernside", Collington Street, Beeston. In 1901, his father John Albert was aged 28 and his mother Rose Annie was aged 27 and born in Northampton. She looked after their two young boys while John, born locally, was yet another parent to work in the local lace industry. Ben's elder brother was then aged 72. Ben was educated at Church Street and joined the 17th Company Boys Brigade on 18th September 1909 at the age of 12. There is nothing showing from research into the old BB documentation to show what is interests were as his name does not appear in the band, football or gymnastics classes. Similarly, we do have not been able to discover where he worked; his Service Record must have been amongst the majority that were destroyed in the Blitz during the 1939-45 War. What is known about Ben is he enlisted into the local Sherwood Foresters Regiment, joining the 1st/7th Battalion known locally as the "Robin Hoods". Private Benjamin Smith was badly wounded on the first day of the "Somme Battle" during the following action. The 1st/7th Battalion moved forward from Foncquevillers for an attack on Gommercourt. The battalion was on the left of the brigade's advance, but were soon swept back by heavy machine gun fire from the enemy. The Official History of the battalion lists 409 casualties out of an attacking force of 536. Benjamin died from his wounds on the 9th July in the No.1 General Hospital, which was located in the small seaside town of Etretat in the Department of Seine-Inferieure, about 26 kilometres north of Le Havre. He is buried in Etratat Churchyard which is situated on the road from the station to the town. Etretat Churchyard - Etretat is a small seaside town, about 26 kilometres north of Le Havre. The churchyard is on the road from the station to the town on the the D940 from Fecamp and the extension is on the south-east side of it, between the church and the railway station. In December 1914, No.1 General Hospital was established in Etretat and it remained there until December 1918. In July 1917, it was taken over by No.2 (Presbyterian USA) Base Hospital Unit, but it continued to operate as a British hospital. The first seven burials took place among the French civil graves but in February 1915, two plots were set aside for Commonwealth burials in the churchyard. These were filled by December 1916 and from then until December 1918, the extension was used. Etretat Churchyard contains 264 Commonwealth burials of the First World War and one German grave. 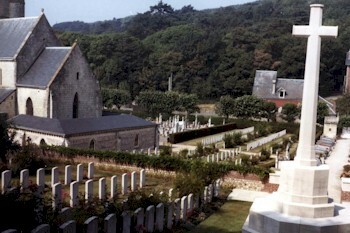 Etretat Churchyard Extension contains 282 First World War burials and four from the Second World War. There are also 12 German graves in the extension. The extension was designed by Sir Reginald Blomfield.